A slice of reclaimed pine, patterned by knots and cracks in the ageing wood, forms a counter top for Aesop's first South Korean flagship store by local studio Wise Architecture. The five-metre-long pine counter was sourced locally and forms the focal point of the Aesop Garosu Store, designed by Wise Architecture to occupy a space in Seoul's Gangnam luxury retail district. The walls and ceiling of the shop are covered in sheets of hanji, a traditional paper material handmade from the bark of the indigenous mulberry tree. The paper has a staggered block pattern that gives the appearance of oversized bricks. "The design for the 40-square-metre space is in keeping with other Wise projects and with Aesop's preference for innovative use of simple, honest materials that draw on local history and tradition," said the studio. "Its subtlety is evident initially in the broad granite stepping stone at the entrance that marks a departure from the busy pavement beyond, and effected within by walls covered with pale-hued hanji, which impart an enveloping softness of palette, texture and atmosphere," added the designers. The wooden counter sits on a blackened-steel base and has a square sink submerged in one end to allow customers to test out products, but it also serves as a cash desk. A strip of brown coir matting with short bristly hairs runs along one side of the counter. 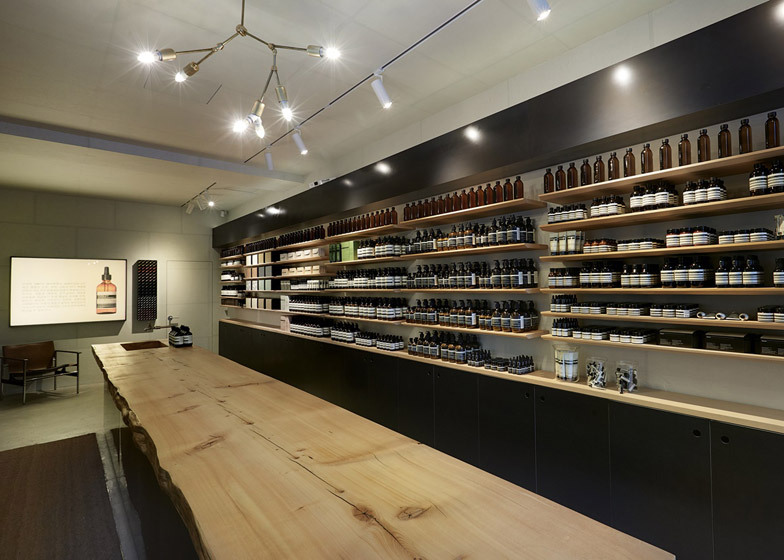 Local timber and black steel were used to construct rows of shelves and cabinets that display the skin and haircare products. The displays are lit by a series of small white spotlights and a pendant lamp by Italian designer Gaetano Sciolari, which has a white branching form with exposed light bulbs. A 657 Sling-back Lounge armchair by 20th-century American designer Charles Pollock – with a leather seat and a tubular metal frame – sits in the back corner of the shop, where a door in the white wall opens into a stock room. The shopfront is entirely glazed to maximise natural daylight and has a shallow granite step by the door. A small wooden plinth in the window displays a range of products in the brand's signature brown-tinged bottles.